HENERY WILKS. The most plausible baptism for Henery Wilks who married in 1679 is in Northbourne, 2 miles east of Tilmanstone where he raised his family. DOROTHY STOAKES. Dorothy was baptised in Temple Ewell, only a mile from Whitfield where she married. This is 2 miles NW of Dover on the Canterbury road. She was a twin. Baptism. 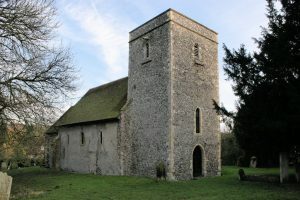 Ss Peter and Paul, Temple Ewell. 1642 May 24 John & Dorrythy the sonne & daughter of Mr John Stokes & Mrs Judeth his wife. The titles ‘Mr’ and ‘Mrs’ denote a family regarded as gentry. 1682/3 Mar 9 Henery son of Henery Wilks and Dorothy his wife. 1685/6 Mar 9 Stephen. Steven was buried on Mar 18. Later that year William of Orange landed in England to take the throne from James II, together with his wife Mary, daughter of Charles II. No burial has been found for Henry. There is a burial in Tilmanstone on 30 Jul 1704 for Dorothy Weeks. No marital status is given. She could be the wife or widow of Henry, or their 16-year-old daughter.